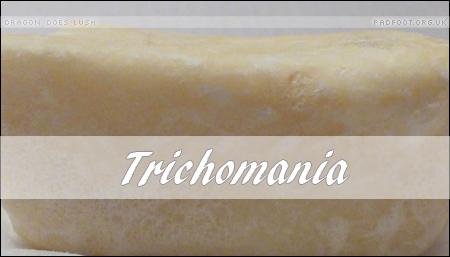 Having tried many of the shampoo bars, I was drawn to the coconut aroma of the Trichomania shampoo bar, although the appearance of the small block wasn’t anywhere near as good as the coconut ice inspired block it was cut from. 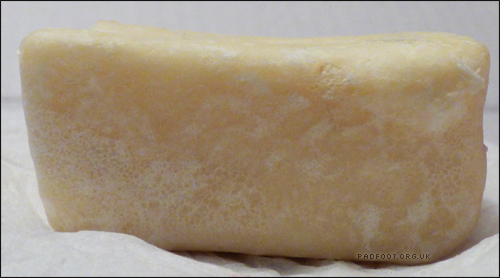 Many people have said this lathers up really easily, but I found it hard to get the lather started. I think this could be down to the level of hard water we have (it’s “very hard”, so right up the top end of the scale), which means you tend to need to use more of a product before you get a lather / bubbles. Once I did manage to get the bar to lather, it was quite easy to rub into my hair, and left it feeling clean as I would expect from a shampoo. The coconut aroma didn’t linger on my hair once I’d rinsed it, but that isn’t a negative for me; I don’t like getting a whiff of shampoo at random points during the day! At £5.95 it’s on a par with the price of the smaller shampoo bars, and considering the bar dried out well after use, I think I should be able to get a nice number uses from it. This entry was posted in Shampoo bars and tagged coconut, shampoo bar on March 3, 2016 by Dragon.